Recently, there was a popular meme going around that gave a visual component to the toll this year has taken on us all. “Me at the beginning of 2016 vs me at the end of 2016” participants borrowed any two pop culture images that collectively describe the ravages of time. One of the more popular entries, though, was comprised of President Obama photos from before and after his two terms. The last eight years have put more than a little snow on the rooftop for America’s chief executive, and etched some worry lines into his face. 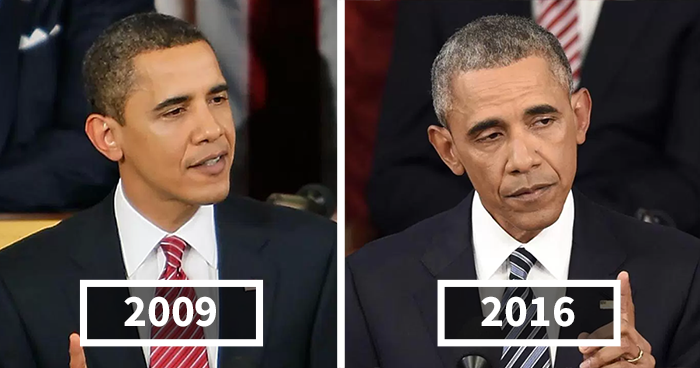 A new gif charts not only these changes in Obama’s facial topography, but all of them going back to when he was a boy. Created by the team at HealthTrends.com, this gif starts with the president as a child and morphs, Michael Jackson’s “Black or White”-style, all the way through present day. Thankfully, though, there’s no police sketch software rendition revealing at the end what Obama will look like after Trump’s term.